In any discussion with retail trading representatives (TRs) about the current depressed state of penny stocks, the Singapore Exchange (SGX) is invariably singled out as being somehow responsible because of its sudden and unprecedented handling of the infamous trio of Asiasons, Blumont and LionGold on Oct 7 when it slapped a “designated” status on them and suspended trading in three stocks for two weeks. While equity markets around the world have been climbing steadily, led by Wall Street, amid signs of a recovery in economic conditions in key economies, the Singapore bourse has gone into something of a hibernation. Yes, the benchmark Straits Times Index has held steady but overall volumes have plunged, reflecting a major loss of trading interest over the past two months. A key deadline for a Blumont Group investor to buy 135 million shares of the company and become its chairman came and went on Friday without any official confirmation on whether the transaction had been completed. Grand plans by Alex Molyneux, Blumont Group’s incoming chairman, to transform the struggling diversified business group into a full-fledged mining company may have hit more roadblocks. In a few months’ time, the local stock market should see the introduction of dynamic circuit breakers in daily trading, which are aimed at giving traders a five-minute cooling-off period to think about what they are doing when prices move by more than 10 per cent in either direction. Some of the parties in October’s penny stock collapse have popped up in a couple of soured deals making their way through Singapore courts involving Malaysian dealmaker John Soh Chee Wen. LionGold Corp, together with a subsidiary of associated firm ISR Capital and Chinese firm Suzhou Power, is partnering a new private equity (PE) fund that invests in natural resources. Erroneous reporting by Goh Eng Yeow to write that MSCI would be dropping the trio from the prestigious market benchmark. The trio are still in MSCI indices. Algo Capital’s mailing address is in Bishan, which is the residential address of its owner and chief executive Ken Tai Chee Ming. The fallout from the penny stock debacle involving Blumont Group, Asiasons Capital and LionGold Corp continues as more stakeholders head to the courts. The legal action being taken against Goldman Sachs could throw new light on the $8 billion share meltdown in Blumont Group, LionGold Corp and Asiasons Capital last month. Global broking giant Interactive Brokers has launched the largest legal action so far in the wake of October’s penny stock collapse, taking aim at at least 10 clients as it seeks to recover about US$68 million of losses. Should investors pick Noble, Olam or Wilmar? Shares of commodity firms Noble Group, Olam International and Wilmar International have lagged the broader market over the last three years. But sentiment seems to be turning. The commodity supplier responded to short-selling attacks by reducing its capital expenditure and lightening its balance sheet. That could spell slower growth, but it might also boost the company’s profitability and cash flows. Is it safe to get back into the stock? Singapore Exchange Ltd (SGX) said on Friday it had split the role of its regulatory and risk chief officer, a move that follows a penny stock crash that raised questions about the firm’s regulatory abilities. 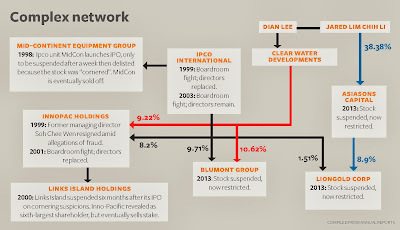 Ipco International CEO Quah Su-Ling is taking a unit of Goldman Sachs to court for losses suffered during the collapse of Asiasons Capital, Blumont Group and LionGold Corp early last month. According to legal papers filed on Nov. 20 with the High Court in the UNK and seen by The Edge Singapore, the case revolves around a loan that Quah took from the bank to buy shares in two of these companies. When contacted by The Business Times last night, the 49-year-old said one of the main reasons for her stepping down was to pursue legal action against Goldman Sachs International and Goldman Sachs Singapore. To say that that the penny stock segment of the Singapore market has pulled back would be an understatement - crash landed and still smouldering would be a more apt description. The dust has yet to settle after the collapse last month of Blumont Group, Asiasons Capital and LionGold Corp, but at least one brokerage firm initially said to have suffered substantial losses from trades linked to the stocks has disclosed its exposure. At Yangon International airport, large blue and white signs in the arrival and departure halls promote Singapore’s stock exchange as the go-to destination for Myanmar businesses seeking capital. The Singapore Exchange (SGX) is mulling new rules on penny stocks after last month's meltdown in these counters caused huge losses to some investors. Are public consultation papers useful? Was Black Elk the black swan that sank Asiasons, Blumont and LionGold? A US-based hedge fund called Platinum Partners, and entities linked to it, had agreed to provide US$560 million in funding to Asiasons Capital, Blumont Group and LionGold Corp in August, September and October as shares in the three companies peaked strongly and then crashed spectacularly. 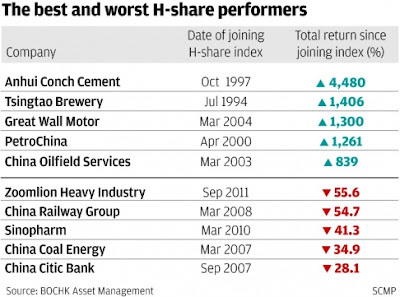 In tracing the sudden collapse of the shares of three listed Singapore-based companies with reported Malaysian links, The Edge cast a spotlight on US hedge fund Platinum Partners Value Arbitrage Fund’s role had in inflating share prices beyond their value. There is a sense of painful resignation, infused with no small amount of frustration and even impending doom among retail players and their brokers following news that the Singapore Exchange (SGX) is pressing ahead with plans to introduce high-frequency trading (HFT) to the local equities market. Since it appears to be a question of when and not if, the exchange should address the myriad issues before opening its doors to a mode of trading that is controversial and has yet to prove beneficial to markets as a whole. The penny stock debacle has cost many local investors dearly and left some facing legal action from brokers and banks determined to get their money. Singapore Exchange, Southeast Asia’s biggest bourse operator, wants to lure more high-speed traders onto its stock market as it grapples with lower volume. The Singapore Exchange (SGX) has been asked about the differences in regulatory actions taken in the case of Sky One Holdings and in the case of Asiasons Capital, Blumont Group and LionGold Corp.
Singapore Exchange (SGX) has found “no threat to fair, orderly and transparent trading” in the sharp drop of Sky One Holdings stock earlier this week. Sky One Holdings’ collapse on Monday prompted a number of brokers to update their lists of restricted stocks this week, raising questions about why the Singapore Exchange (SGX) did not impose trading curbs as it had done with three other stocks a few weeks earlier. Singapore Exchange Ltd ‘s role as the city-state’s equity market regulator is coming under increasing scrutiny in the fall-out from a penny stock crash earlier this month. An association representing Singapore’s retail investors has called for a probe into a recent plunge in the share prices of three companies, putting more pressure on the Singapore Exchange Ltd (SGX) to explain the volatility. More than a week after the Oct 4 crash involving Blumont Group, Asiasons Capital and LionGold Corp, remisiers and securities houses are still counting their losses. Broking firms contacted by The Edge Singapore say their contra losses on the three counters are manageable, but the situation on the ground for other houses, as their traders tell it, is a lot messier. Datuk Jared Lim and Datuk Mohamed Azlan Hashim have denied any links to tycoon Datuk Soh Chee Wen, whose name has become a topic of conversation at coffee tables and trading rooms of late. Asiasons is picking up the pieces after a spectacular collapse in its share price. 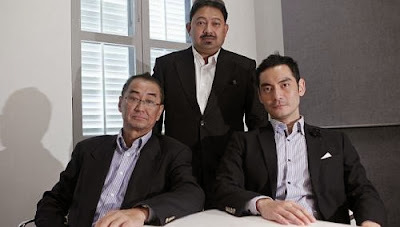 The controlling owners of the company – Datuk Azlan Hashim, Datuk Jared Lim and Ng Teck Wah – have been fighting fire since the freefall of the company’s shares. Comforting investors, stakeholders and employees that nothing has changed within the operations of the company is the No. 1 priority as the company and its owners go about rebuilding their reputation. Below is an extract of an interview with StarBizWeek. In the past week, there has been significant press coverage on the now infamous trio of designated stocks - Asiasons Capital, Blumont Group and LionGold Corp. The sell-down of three stocks two weeks ago on the Singapore Exchange (SGX) was mainly triggered by a leading US-based investment bank followed by a Singapore broker, said industry executives. Asiasons Capital Limited said on Thursday that it would relook the terms and conditions of its planned purchase of 27.5 per cent of US Black Elk Energy Offshore Operations LLC. Blumont, Asiasons Capital and Lion Gold have lost billions of dollars in market value this past week. Yet, they are still pressing ahead with ambitious growth plans, with Blumont even claiming it is on its way to becoming Asia's BHP Billiton. Should investors give them a second chance? Shares of key executives of Blumont Group have come under forced selling as Singapore Exchange (SGX) maintains trading restrictions on the company’s stock and those of two others for a fifth day today. LionGold Corp said the trading restrictions imposed on its shares put it at a “significant disadvantage” as they hinder its efforts to acquire undervalued assets. 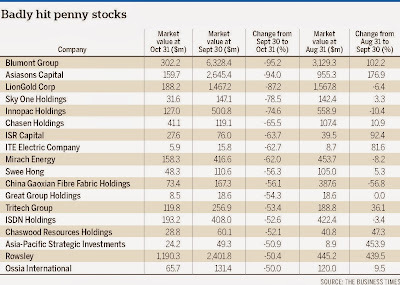 The rise and fall of Blumont Group, Asiasons Capital and other penny stocks have dominated the Singapore stock market, culminating in the Singapore Exchange (SGX) imposing restrictions on the trading of some of the stocks. Confusion reigned for a second day yesterday over three stocks “designated” by the Singapore Exchange: Blumont Group, Asiasons Capital and LionGold Corp.
Blumont Group said on Tuesday that it was not aware of any manipulation of its share price, calling it the job of the Singapore Exchange (SGX) to find out and not that of the management. Retail investors are not the only victims feeling the pain after the share price plunges of LionGold Corp, Blumont Group and Asiasons Capital when they resumed trading yesterday. Has SGX acted too late? Last Friday, the Singapore Exchange (SGX) took the drastic step of cleaning up what had been left smelling in its backyard over the years. Three Singapore-listed companies resumed their steep decline on Monday as trading halts were lifted - suspensions which have raised more questions than answers about the stocks as well as how the country’s exchange regulates sudden price moves. The share market was rocked yesterday when the Singapore Exchange (SGX) suspended trading in three stocks that have all recorded huge price swings recently. In its second reply to a Singapore Exchange (SGX) query on the sharp rise of its share price since the beginning of the year, Blumont Group said its recent flurry of activities could have attracted international interest in its stock. Investors of Blumont Group, whose stock is arguably one of the best performing this year, would be laughing all the way to the bank had they held on to the shares they bought early this year. The scary movie "The Conjuring" may be a winner at the box office this summer, but on Wall Street the real horror show is the gold mining sector. Standard Chartered's asset quality is deteriorating and investors are miscalculating risk in the loan book of the British lender, according to Carson Block, founder of U.S.-based short seller Muddy Waters Research. China’s burgeoning middle class is buying diamonds so quickly that the price of mass-market stones is rising faster around the world than for top-quality jewels affordable only to the super-rich.